We are committed to the protection of the environment. We aim to contribute to the quality life on the Isle of Wight. Our commitment extends to all our activities. Our goal is to reduce environmental harm, minimize the use of energy and other resources and ensure that the principles of sustainable development are operated throughout our business. We are committed to reduce, re-use and recycle as much as possible. We aim to turn off electrical equipment when not in use, to minimise electrical consumption by the use of energy efficient lighting. We print brochures and literature in small batches to ensure waste is kept to a minimum. We ensure that our staff are educated in environmental policies. We only undertake necessary car journeys. We favour small locally owned guest houses and small hotels rather than large chains so tourist revenue remains on the island. We prefer to use accommodation that has an environmental policy in place. We encourage local proprietors to use locally grown or reared produce when possible. When possible we encourage our clients to leave their cars at home and use public transport to the island. We supply all our clients with the islands public transport details and timetables. We promote environmentally friendly ways of enjoying the island in particular horse riding, cycling and even llama trekking. We encourage our walkers to be responsible and to respect the Countryside Code (a copy of which is supplied in their walking pack). Green Island is a programme aimed at developing a more sustainable, environmentally sensitive tourism industry across the Isle of Wight. All businesses who are members of the Green Island Awards Scheme and are all graded with either Gold, Silver or Bronze standards depending on their commitment to improved environmental, economic & social performance. From a gentle stroll or relaxing picnic to a long-distance walk or heart-pumping adventure, the countryside provides every opportunity for enjoyment and relaxation. There are country parks, beaches, woodlands, rivers and forests, as well as thousands of miles of public rights of way and other sign-posted routes you can explore on foot, on a bicycle or on a horse. You can also walk across some parts of the countryside designated as open land, such as mountain, moor, heath, down and common land. If you follow the Countryside Code wherever you go, you'll get the best enjoyment possible and you'll help to protect the countryside now and for future generations. Be safe - plan ahead and follow any signs. Refer to up-to-date maps or guidebooks. You're responsible for your own safety and for others in your care, so be prepared for changes in weather and other events. Check weather forecasts before you leave and don't be afraid to turn back. Get to know the signs and symbols used in the countryside to show paths and open countryside. Leave gates and property as you find them. Follow paths across land that has crops growing on it, wherever possible. Use gates and stiles wherever possible - climbing over walls, hedges and fences can damage them and increase the risk of farm animals escaping. Our heritage belongs to all of us - be careful not to disturb ruins and historic sites. Leave machinery and livestock alone - don't interfere with animals even if you think they're in distress. Try to alert the farmer instead. Litter and leftover food doesn't just spoil the beauty of the countryside, it can be dangerous to wildlife and farm animals and can spread disease - so take your litter home with you. Dropping litter and dumping rubbish are criminal offences. Discover the beauty of the natural environment and take special care not to damage, destroy or remove features such as rocks, plants and trees. They provide homes and food for wildlife, and add to everybody's enjoyment of the countryside. Wild animals and farm animals can behave unpredictably if you get too close, especially if they're with their young - so give them plenty of space. Fires can be as devastating to wildlife and habitats as they are to people and property - so be careful not to drop a match or smouldering cigarette at any time of the year. Sometimes, controlled fires are used to manage vegetation, particularly on heaths and moors between October and early April, so please check that a fire is not supervised before calling 999. Showing consideration and respect for other people makes the countryside a pleasant environment for everyone - at home, at work and at leisure. Busy traffic on small country roads can be unpleasant and dangerous to local people, visitors and wildlife - so slow down and, where possible, leave your vehicle at home, consider sharing lifts and use alternatives such as public transport or cycling. Respect the needs of local people - for example, don't block gateways, driveways or other entry points with your vehicle. Keep out of the way when farm animals are being gathered or moved and follow directions from the farmer. When riding a bike or driving a vehicle, slow down for horses, walkers and livestock and give them plenty of room. By law, cyclists must give way to walkers and horse riders. Support the rural economy - for example, buy your supplies from local shops. The seaside is a great place to visit and enjoy, but it can be dangerous if you don't take care while you're there. By following the Seaside Code you can stay safe and healthy, and also ensure that you leave all the plants and animals as you found them for others to enjoy. Please respect the coast, and the plants and animals that live there. Remember to always follow the Seaside Code. Leave Us Alone Any animal or plant that you find on the coast can only live there. Please leave things where you find them, and don't take them home. Stones and pebbles on the beach look very attractive, but they are there for a reason. Removing stones from the beach will harm the many plants, animals and birds that live and feed amongst them. Watch The Tide Stay safe by making sure that someone knows where you are going and when you are due back, and keep to this plan. Make sure you know the times of the tides, and keep checking so you don't get cut off as the tide comes in. If you are going to swim, make sure you stay close to the beach and never jump from the breakwaters. Dog Owners Please keep your dog under control. At some times during the year, you and your dog may disturb nesting or feeding birds. Please take note of any signs and help to look after the local wildlife. Mind Your Step Sand dunes are a fragile habitat and are also protected in the area. Help look after them by using paths and boardwalks, and by parking in marked bays. Healthy And Happy Stay healthy by washing your hands after visiting on the beach, and especially before you have anything to eat. Help the birds and animals stay alive by taking your litter home with you and clearing up after your dog. Discarded rubbish can kill! The Isle of Wight is a very special place with landscapes, wildlife and heritage of national and international importance. Visitors have been coming to the Island for many years because of its tranquillity and its rich variety of coast and countryside. Tourism is vitally important to the economy of the Isle of Wight yet very little of the money earned from tourism is put back into looking after the countryside itself. Gift To Nature is a new scheme which gives visitors the opportunity to put something back into the island's environment. With the support of Island business, Gift To Nature aims to show how tourism and conservation can help each other. Gift to Nature is all about voluntary giving - it is not a tourist tax. Many tourism businesses on the Island are participating in Gift to Nature by asking their customers to make a voluntary donation through collection envelopes, special collection boxes or by adding a small, optional supplement to the accommodation bill. Other areas in the UK and across Europe have tried this approach, called "visitor payback" and have found it to be generously supported by visitors. In return, the tourism industry can develop more of a caring reputation by demonstrating how tourism can positively help the local environment. All of the money raised through Gift To Nature will be spent on the Isle of Wight on local conservation projects. 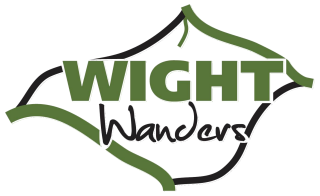 To encourage green tourism on the Island WIGHT WALKS will make a donation to Gift to Nature for each booking received where the guests DO NOT bring their car on the Island, in addition will supply donation forms to all those clients that visit the Island and wish to make a personal contribution. 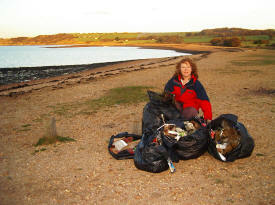 The Wight Walks team regularly go beach cleaning whilst out walking the coastal path. Sandie Norris on Thorness Bay beach Nov 2007 following a high tide.